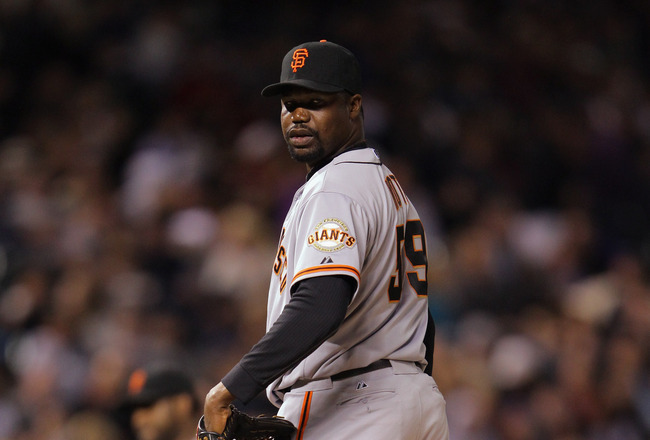 Giants pitcher Guillermo Mota was handed a 100-game suspension for a second violation of the MLB’s drug policy. Well done Mota. LIVINGSTONE: Congratulations, Guillermo Mota, on your recent entry into the history books – of embarrassment. So you’re the third player in baseball history to test positive for a banned substance twice. The other two? Oakland A’s outfielder Manny ‘I’m going to quit baseball abruptly instead of facing another embarrassing moment in my career’ Ramirez and former Detroit Tiger Neifi Perez. Yeah, I don’t really know the latter either, he apparently made some big double play on a Justin Verlander no-hitter in 2007, a month before being nailed for violating the league’s substance abuse policy. So, Mota, you’re now, again, among the most dishonorable in baseball. In fact, you’re among an elite group of players who thought they wouldn’t get caught a second time. You’re 38 years old, so the excuse of ‘I didn’t know what was being injected into me’ or ‘I thought it was just vitamins’ doesn’t really fly. You’ve been around long enough to know when something is wrong and, I’d hope, ask questions when someone is about to inject you with something. However, it’s quite possible you just turned a blind eye and said ‘whatever, I’ve got to keep playing’. Either way, you are among the embarrassing few in baseball who continue to remove a little bit of what purity in the sport is left. Thankfully, you’re not a big name player, like Rodriguez or Clemens or Manny, who have helped lead teams to the promise land. Well, you did win the World Series in 2010 when you were with the Giants, but you struggled and didn’t really help out in winning that series. Thankfully, you fall into the category of semi-no names like Jay Gibbons and former Colorado Rockies pitcher Dan Serifini who were handed 50-game suspensions after failing drug tests. It’s sad really. In 2012, after all that has gone on with steroids and performance-enhancing drugs – and watching Roger Clemens drag his whole image through the mud being the stubborn man he is – you’d think players would want to avoid this kind of embarrassment – not only for themselves but for their teams, the players and all of professional baseball. The bad example players like Mota set, the win at all costs way of life, will fall on impressionable young players to seek out the same products to make them better ball players. Whatever the case may be, Mota is another one of those guys we just can’t wait to retire, disappear into the sunset, never to be heard from again.